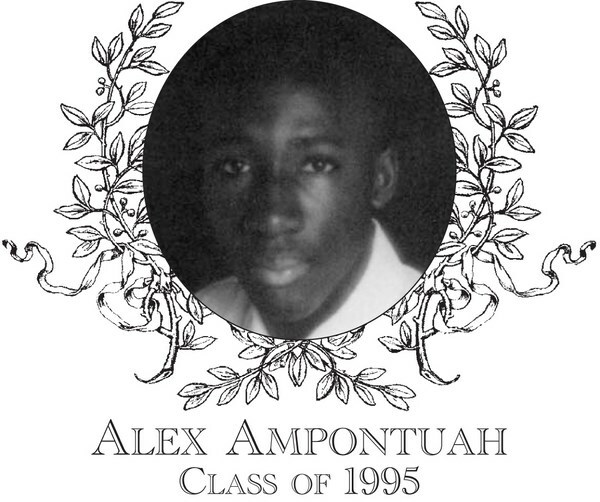 Alex Ampontuah, Class of 1995, was an outstanding two-sport athlete at Bartlett High School. In the fall, Alex played soccer at Bartlett High School earning three letters. However, it was in the spring, on the track, where Alex left his mark on Bartlett High School sports. Alex was a member of the Track Team at Bartlett for four years. In his junior year, the track team went undefeated with a record of 12�0. During that season, Alex was entered into 35 events, placing first in 17 of these events, for a winning percentage of 48%. It was in his junior year, where Alex�s skill in the triple jump was brought to the forefront. He placed third at the District Meet which qualified him for the MIAA State Meet where he placed 20th out of 36 contestants. Due to his dedication to the sport of track, as well as his quest for excellence, Alex was elected captain of the 1995 team. It was during the 1995 season that Alex�s mark was left for all athletes after him to follow. The team went 7�3�1. Alex competed in the long jump and was undefeated. He set school records in the 100 meters, where he was undefeated; 200 meters; 400 meters; and, his specialty, the triple jump where he was also undefeated. At the 1995 Class Meet, Alex continued his dominance in the triple jump by placing first. He was dominant at the Border Conference League Meet in 1995. Alex placed first in the 100, long jump, and the triple jump. In all, Alex competed in 35 events, and placed first in 33 of these events for an outstanding winning percentage of 94.2%. In his last two seasons of track at Bartlett, Alex competed in 70 events and placed first in 50 of them for a 71.4% winning percentage. At the District Meet in his senior year, Alex placed first in the triple jump with a school record jump of 44�3��! This record still stands to this day! In the 1995 State Meet, Alex improved on his junior year result by placing fifth out of thirty-six contestants. Alex was selected to the 1995 Worcester Telegram and Gazette All-Star Track and Field Team, and to the 1995 Border Conference All-Star Team. Alex is now an investment banker working for RBC Capital Markets in New York City. In addition, he has completed the New York and Paris Marathons and is training for the Berlin Marathon.